I’ve never ran a race as a training run before, I’ll have to do it more often. It’s really liberating to not worry about a time and just enjoy the race, chill out and listen to music or an audio book, soak up the crowd and stop to take photos. I couldn’t have chilled out for Brighton Half, I was always gonna play a hard and fast game at home. This race was different. At one point about 8 or 9 miles in I actually turned around and ran back on myself to get an awesome shot of some lovely supporters with their signs. There wasn’t the mass support around most of the course that I’m used to from racing in Brighton, instead small pockets of people cheered at various points, (along with the awesome marshalls high fiving everyone), and this family’s welcome warmed my heart so I had to go back and get a photo. The North London Half was great. A very well organised race with a surprisingly hilly course (must remember to check course profile before racing! ), around a maze of residential areas, livened up by starting and finishing at the Allianz Stadium, with a brief jaunt through the mighty Wembley Stadium. Which isn’t as big as it looks on TV, but exciting nonetheless. The run up to the stadium was really quite exciting and I forgot all about the big hill we’d just ran down (and would have to run back up) to get there. 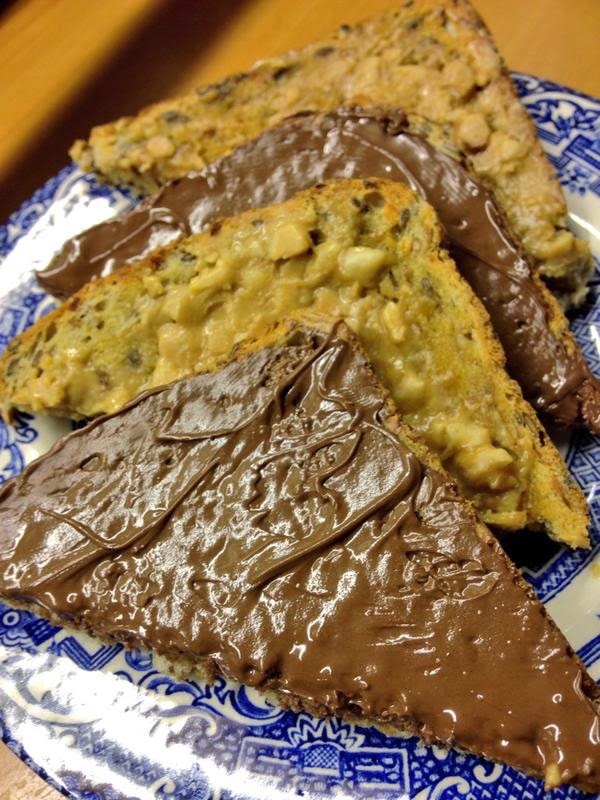 Fuelled on a glorious concoction of peanut butter and Nutella on Vogel’s toast (pulling out the chocolate-shaped big guns for the long runs now), I ran the 5.5miles from where I was staying at Tufnell Park to the home of the Saracens Rugby Team to join the race. I say ran; it was quite a stop-start affair along some very busy roads and bypasses that involved me pulling my phone out every 10 minutes to make sure I was going the right way. I got there just as the mass warm up was finishing, in time to quickly drop my bag (very speedy bag queues!) and make my way to the start. The (slightly delayed) start involved a fair bit of shuffling to get us over the line, but once we did I caught a glimpse of the brilliant Mo Farah, who was the official ambassador of the race and who I’d be meeting later at the post-race Q&A (if I finished in time). The race itself for me was quite hard and uncomfortable in places; the hills came as a surprise but were by no means impossible, and nothing compared to some of the hills we’ve been running at RunBrighton. My legs were just pretty tired in general (bring on the taper!) and I was having trouble running consistently at my planned marathon pace of around 10:20min/mi. My original plan was to run a slow first half and then pick it up to marathon pace for the last 60 minutes as per my training plan instructions, but I actually found it quite difficult to slow down and kept finding myself around the 9.30-10min/mi mark. At some points I looked at my watch and was running nearer 9min/mi so kept slowing down. I dunno if that means I need to practice marathon pace more or if I need to maybe think about running a faster marathon, at around 10min/mi instead?? Not sure if I could keep that up for the big 26.2… any ideas? It may be because I haven’t practiced marathon pace much until now, and need to sharpen up in these final three weeks. Anyway, the miles ticked by and of course the phone came out at various intervals for selfies and impromptu photos, and I stuck near the 2:15 pacer to come in at a decent time and make it to the Q&A to meet the mighty Mo Farah afterwards. Not a bad incentive to keep running, I reckon! By the last few miles I was hurting and kept thinking about walking but couldn’t bare to miss out on meeting Mo and knew it’d be good practice for the marathon if I could keep plodding through the pain. I’d love to not walk at all at Brighton but I know that’s much easier said than done after 20+ miles. I picked up the pace for the finish straight and came in at 2:14:02 which I’m really pleased with (the text came through within half hour of finishing), totting up an 18.77 mile penultimate long run for Brighton before the taper in two weeks. As far as long runs go, it was much better than last week’s painful escapades. I’m not twitching about the .23 miles to make it up to 19. Not at all. a nose at the stats click the image. I’m really excited to see what I can do at Brighton this year – even though this half with the miles before it were tough I know I’m much stronger than I was and will definitely get a PB, just fingers crossed I don’t get injured! I made it to the Q&A by the skin of my teeth with less than 10 minutes to spare. You should’ve seen me try to ‘run’ to get my bag from picking up my wristband. It’s funny how you can’t possibly run any further once you’ve stopped. Meeting Mo was obviously amazing, and really humbling to be in the same room as such a legendary athlete. When I grow up, I want to run like him. He answered questions about his training goals for this year and 2016, coming first in 18seconds in a 100m sack race, how he felt and what he learned during his first marathon at London, how to get faster, advice for a beginner, as well as answering my questions about his recovery routine. Me and my mate Mo!! He spoke about how he still 100% enjoys running, and how he hates taking a break as he misses it. I think we can all relate to that, how hard is it when we’re injured, or our bodies are just knackered and we’re forced to rest? He also spoke about his struggles with making his career fit around his family life, and the toughest thing is being away from his wife and children. Again, I don’t have kids yet but already I can appreciate that sometimes, especially in this stage of marathon training when the weekends are all about prepping for, doing and recovering from the long run, it’s hard to balance ‘real life’ with training, and spending proper time with your loved ones that doesn’t involve you writhing around in pain on the foam roller while they watch telly. 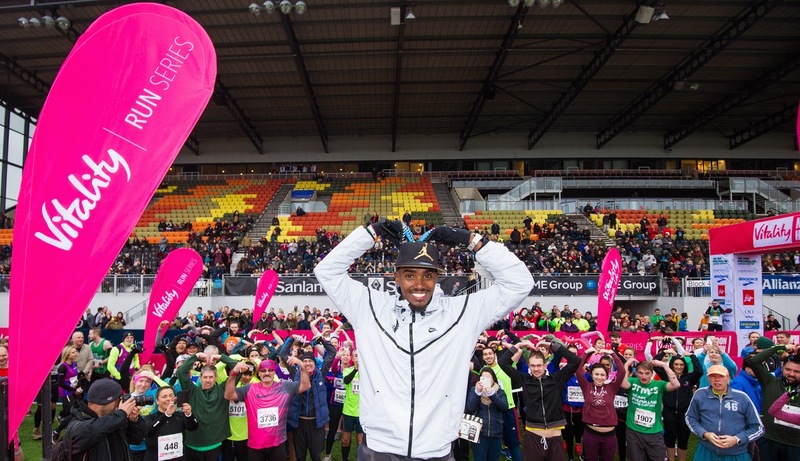 Mo Farah spoke as the official ambassador for the Vitality North London Half Marathon, the ’Stadium to Stadium Half’. 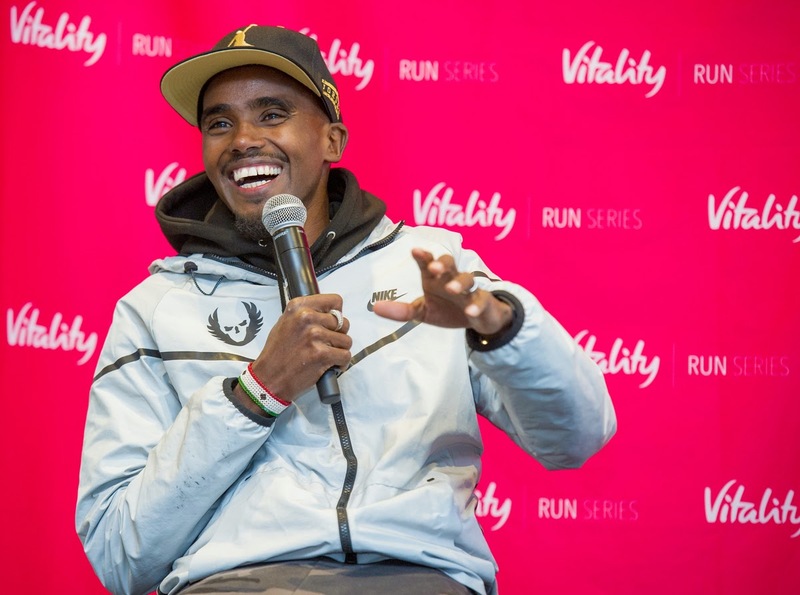 The event is the latest instalment in the Vitality Run Series. Porridge or three slices of toast with jam or honey. Don’t put too much pressure on yourself. 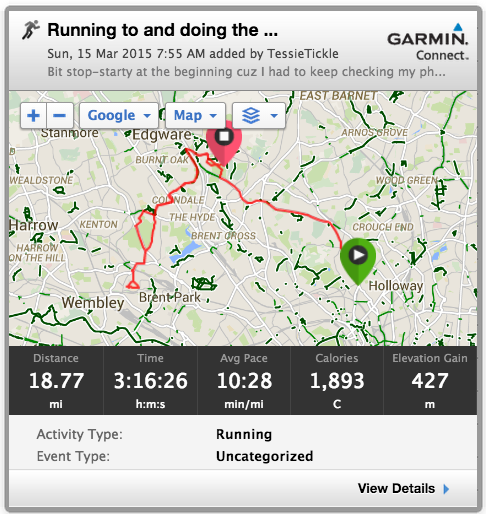 When heading out for a long run, don’t look at the remaining miles (one down, only 18 etc. to go) – zone out and forget about it, you’ll be surprised how quickly it goes. Don’t over train. Increase your training a little bit each week and be consistent. Get to the top of your game and then cut back and have a break to allow your body to absorb the training. Mo told us that learning to rest was a hard lesson for him, and I think it is for all of us. 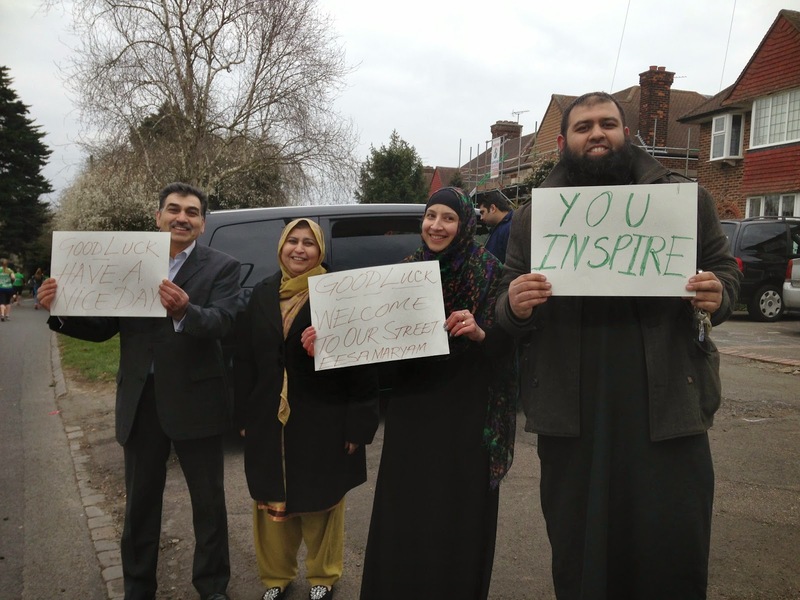 Set yourself different targets – Mo set out to get into the top 3 for a medal at the 5 and 10k London 2012 races, and once he saw he could push on for Gold, he did so then. This doesn’t mean you have to come in the top 3 for your first marathon – just set yourself three targets. To finish should be your first, before you think about any time goals. Keep moving, jog slowly or walk after your run, don’t stop. Eat well, rehydrate, get a massage if you can. Get in the ice bath. I asked Mo how long he takes in his, as I usually have around 15 minutes and he said 10-12 so I’m happy to listen to the man and get out earlier! Run more, and run faster. Increase mileage and get to the track. Thanks to the Vitality North London Half Marathon for my race entry, and thanks to Mo Farah for meeting us and having a photo with me! Did you run the North London Half? Whether you did or not, how’s your marathon training going, are you earning medals for your long runs?